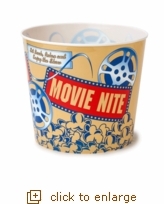 Enjoy an authentic movie night at home in style with our nostalgic, cinema style JUMBO popcorn tub. This JUMBO sized popcorn tub is ideal for serving popcorn in or for someone who loves their popcorn and lots of it! It is made of plastic so they can be reused over and over again. It is large enough to hold a full 6 quarts of popcorn. This JUMBO tub measures 10" across the top and is 8.5" tall. Holds approximately 42 cups of popped popcorn.